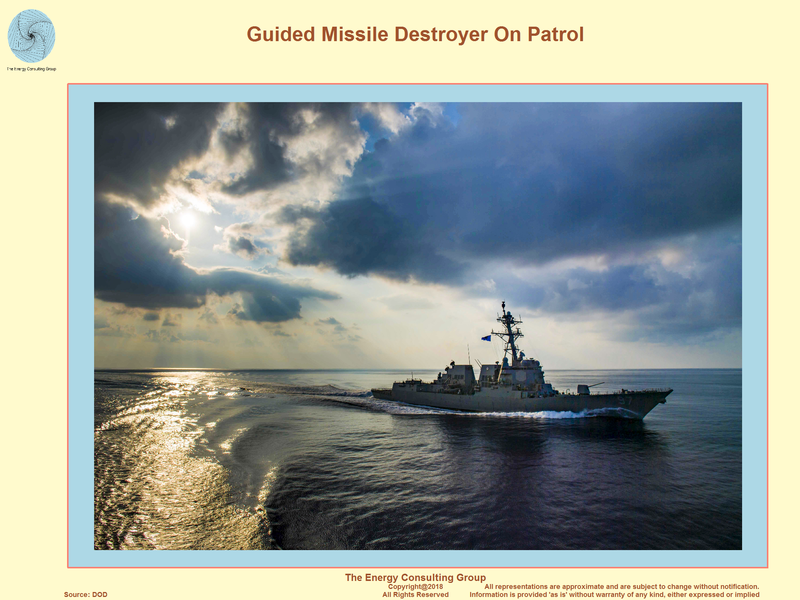 .Contact us at insight@energy-cg.com to find out how we can help you. 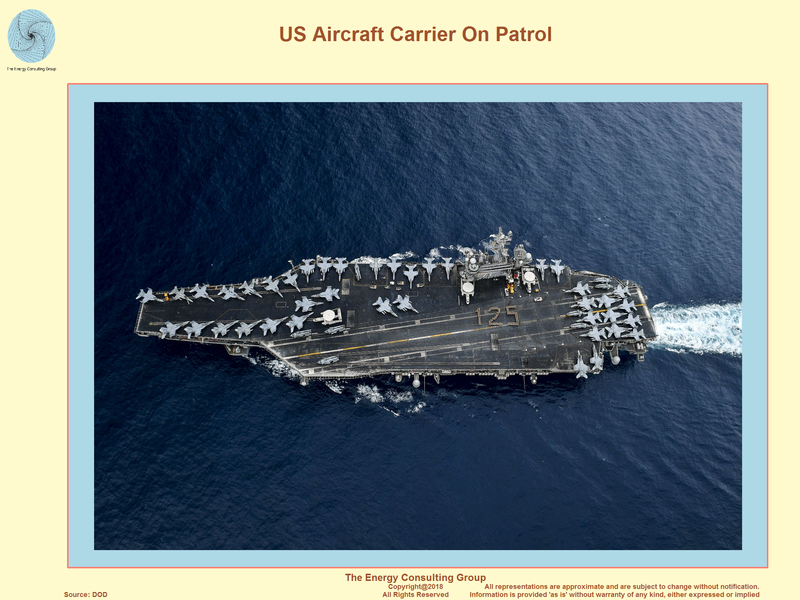 Interactive, 3D Map of this image: zoom, rotate, and roam. control the viewing perspective (roam) using the right mouse button.) 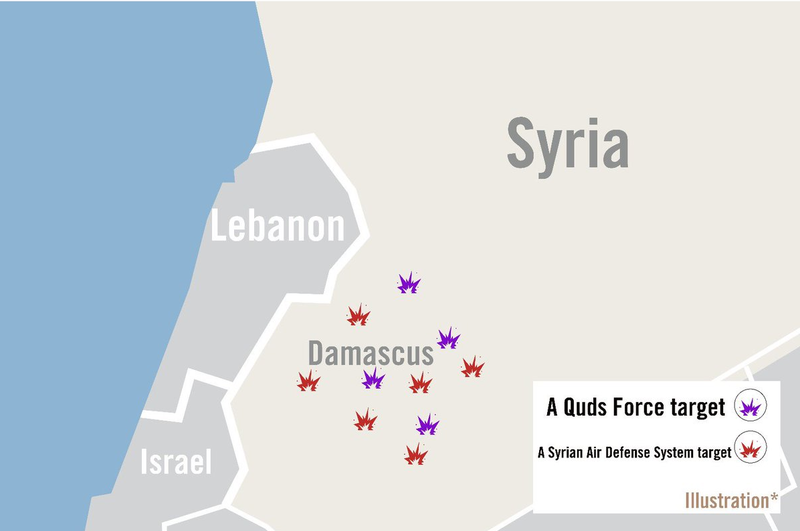 Israeli Defense Force (IDF) supplied map of airstrikes on Jan 21, 2019. 1) spreading to Saudi Arabia? 1a) Could active involvment by KSA lead to more attacks targeting Saudi Aramco oil field and facilities? 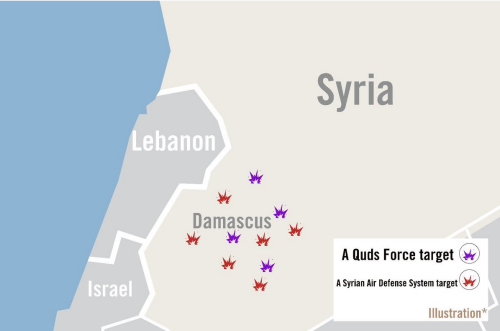 1b) The Real Next War in Syria: Iran vs. Israel Hard to see how active, open conflict between Israel and Iran would not spread to Iraq and Saudi Arabia. 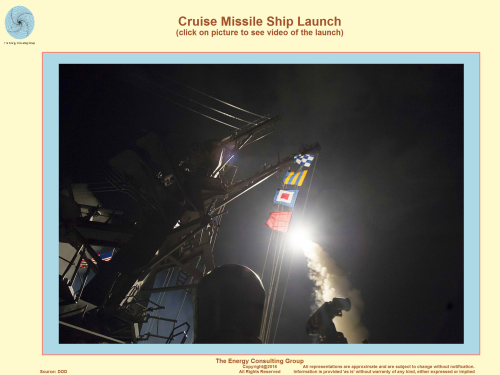 2) supporting renewed sanctions against Iran? 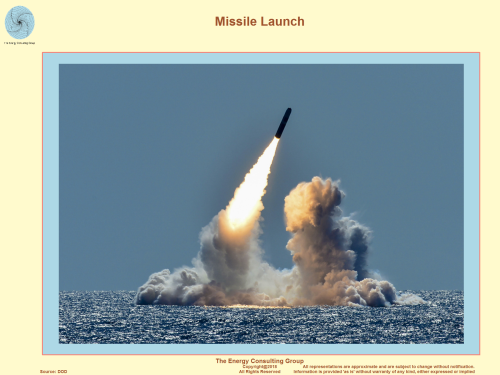 3) becoming a broader conflict involving a nuclear armed Russia? 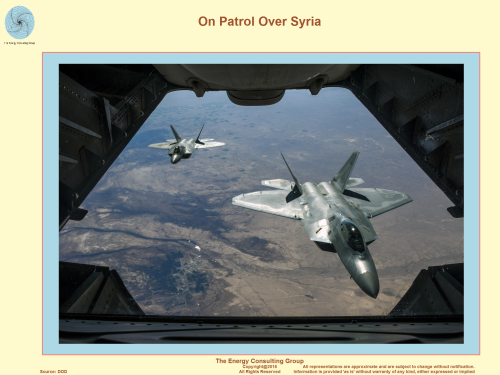 How is Russia likely to respond to US strikes in Syria? For Higher Resolution, Click Image Battle between US and Russian forces for Syrian oil and gas fields in the Deir el-Zour province. Per a Bloomberg article describing the battle, "More than 200 contract soldiers, mostly Russians fighting on behalf of Syrian leader Bashar al-Assad," were killed. This news report indicates that Russian contractors earn up to a 25% ownership interest in each oil and gas field captured and returned to the Syrian government control. 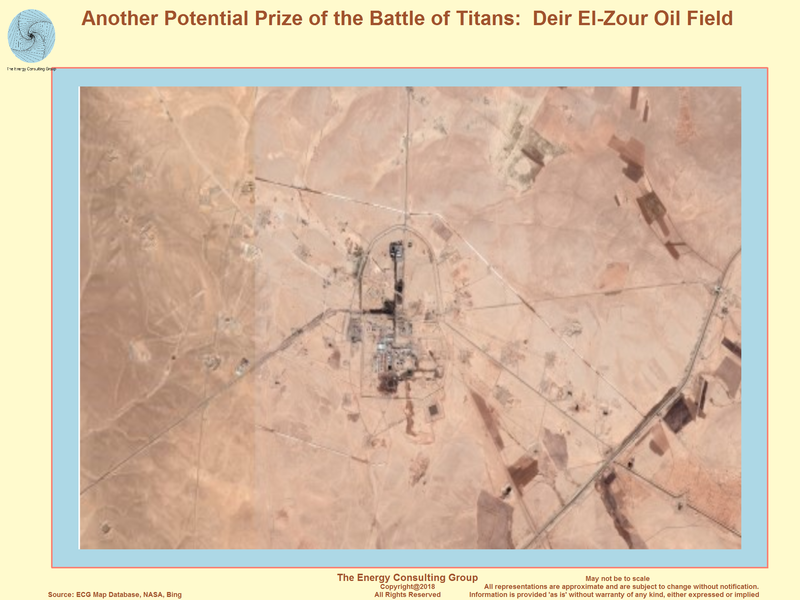 As the following pictures show, the oilfields that were the apparent target of the attack on Deir el-Zour, were all heavily damaged in the Syrian civil war. 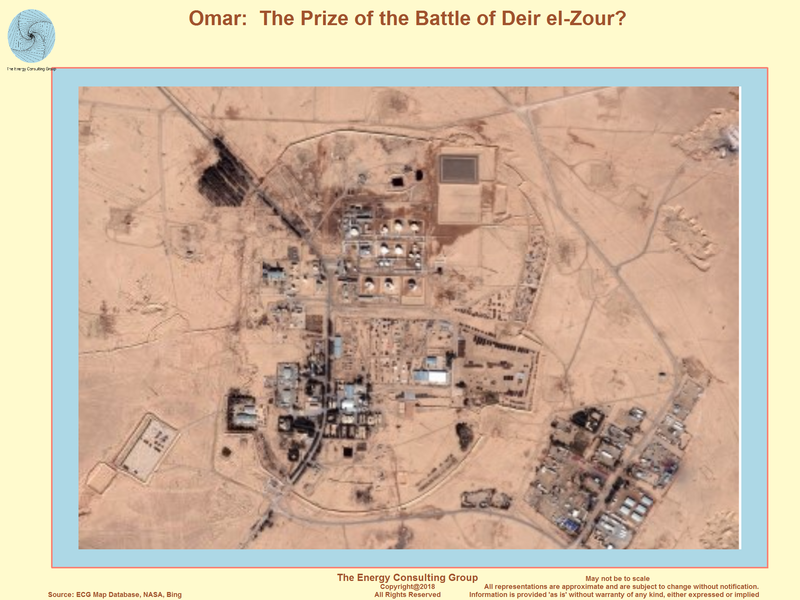 Omar Oil Field: Was this the Prize of the Battle of Deir el-Zour? The following panel contains an interactive 3D elevation map of most of Syria with an overlay of the road network and notable population centers. It is intended to help provide geographic context for the important oil and gas producing regions in Syria. To use the interactive map, rotate it using the left mouse button, zoom using the mouse wheel, and control the viewing perspective using the right mouse button. Link to full screen version the rotatable, zoomable 3D oil and gas map of Syria shown in the above panel insert. 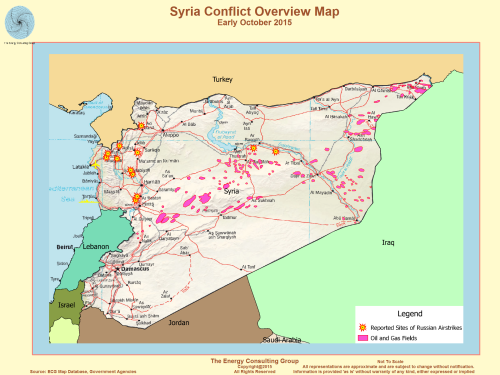 Link to page with estimate of field level oil production potential in Syria. 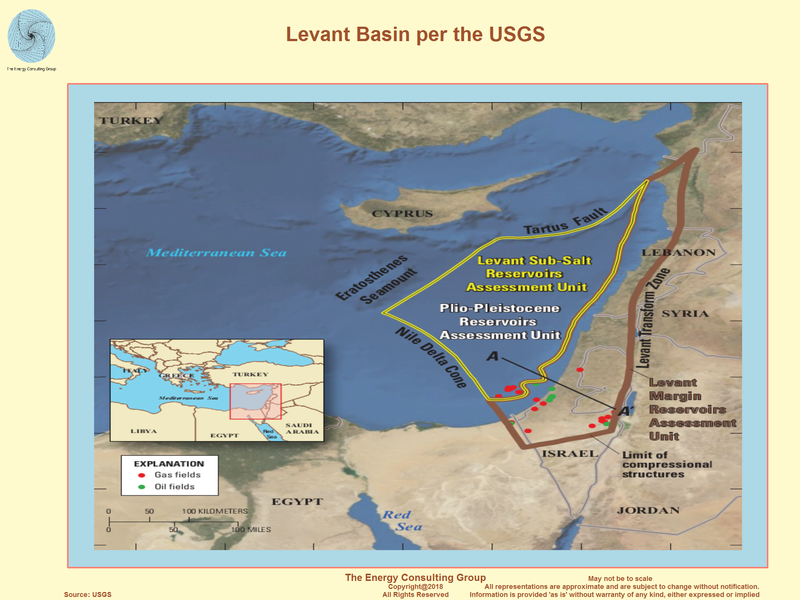 "An estimated 122 trillion cubic feet (tcf) (mean estimate) of undiscovered, technically recoverable natural gas are in the Levant Basin Province, located in the Eastern Mediterranean region. Technically recoverable resources are those producible using currently available technology and industry practices. This is the first U.S. Geological Survey assessment of this basin to identify potentially extractable resources. Natural gas is used for a variety of purposes, primarily for electricity generation, industrial, residential, and commercial sectors. Worldwide consumption and production of natural gas was 110 tcf in 2008, according to the Energy Information Administration. The three largest consuming countries were the United States with 23 tcf, Russia with 17 tcf, and Iran with 4 tcf of natural gas per year in 2008. Russia’s West Siberian Basin is another large natural gas province with an estimated 643 tcf. The Middle East and North Africa region also has several large provinces, which include the Rub Al Khali Basin with 426 tcf, the Greater Ghawar Uplift with 227 tcf, and the Zagros Fold Belt with 212 tcf. Some natural gas accumulations in the United States include the Southwestern Wyoming Province with an estimated 85 tcf, the National Petroleum Reserve Alaska Province with 73 tcf, and the Appalachian Basin Province of the eastern United States and the Western Gulf Basin Province of Texas and Louisiana, each with 70 tcf. All of these estimates are mean estimates of undiscovered, technically recoverable gas resources." A group of oil companies entered Syria and carried out geological and geophysical works on almost every Syria. 270 exploratory wells were drilled and the Syrian Oil Company recorded several explorations. Syria's energy sector is in turmoil because of the ongoing civil conflict that began in the spring of 2011, with oil and natural gas production declining dramatically since then. Syria's energy sector has encountered a number of challenges as a result of conflict and subsequent sanctions imposed by the United States and the European Union. Damage to energy infrastructure—including oil and natural gas pipelines and electricity transmission networks—hindered the exploration, development, production, and transport of the country's energy resources. Syria, previously the eastern Mediterranean's leading oil and natural gas producer, has seen its production fall to a fraction of pre-conflict levels. Syria is no longer able to export oil, and as a result, government revenues from the energy sector have fallen significantly. Prior to the current conflict, when Syria produced 383,000 barrels per day (b/d) of oil and 316 million cubic feet per day (Mmcf/d) of natural gas, Syria's oil and gas sector accounted for approximately one fourth of government revenues. Syria faces major challenges in supplying fuel oil to its citizens. Electricity service in much of the country is sporadic as a result of fighting between government, opposition forces and the Islamic State of Iraq and Syria (ISIS). Further, the exploration and development of the country's oil and natural gas resources have been delayed indefinitely. 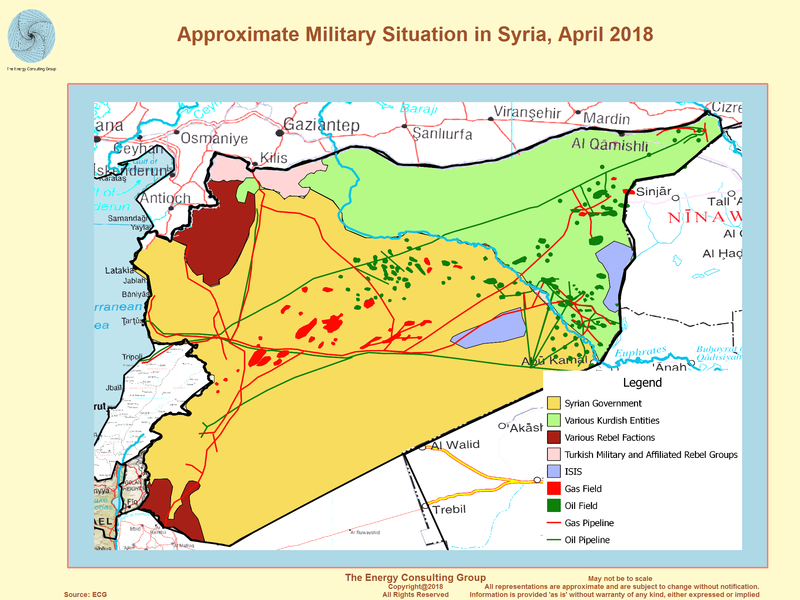 Nevertheless, even if the fighting were to subside, it would take years for the Syrian domestic energy system to return to pre-conflict operating status. 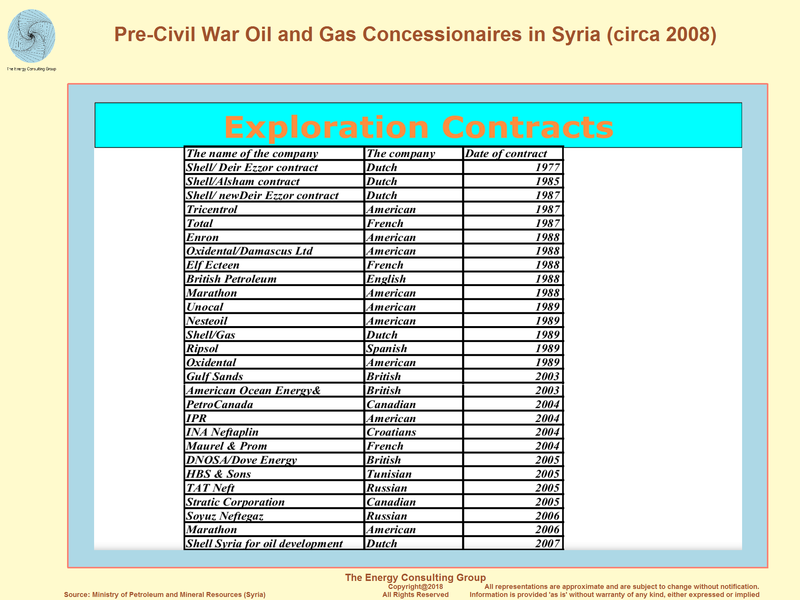 In 1964, Syria passed legislation that limited licenses for exploration and investment to the Syrian government. The Ministry of Petroleum and Mineral Resources oversees the Syrian oil and natural gas sectors, and is in charge of setting policy priorities and coordinating the efforts of the state-led companies that operate in the sector. 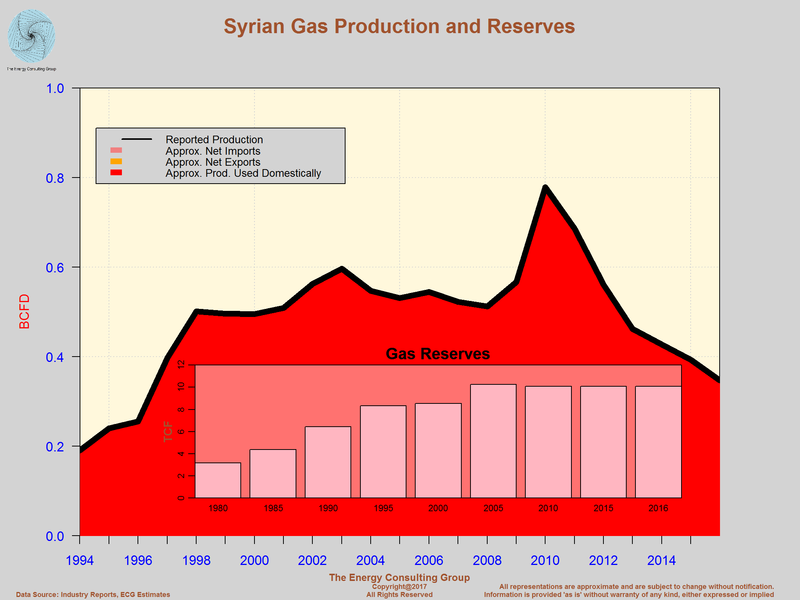 The following information reflects the pre-conflict operating status of Syria's oil and natural gas sector. The General Petroleum Company (GPC) oversaw the strategies for exploration, development, and investment in Syria's oil and gas sector, and supervised the activities of its many affiliated companies, including the Syrian Petroleum Company (SPC) and the Syrian Gas Company (SGC). 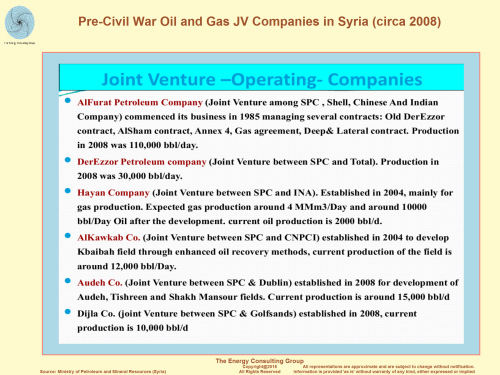 The SPC was Syria's largest state-owned oil company, and it had a number of production-sharing agreements (PSAs) in place throughout the oil sector. Most of the country's PSAs were split equally between the SPC and its partners. These arrangements often ensured that the Syrian government retained a certain percentage of the oil produced in its fields as royalties. Contracts regularly lasted up to 25 years. The SPC operated through several subsidiaries, the most notable being the Al-Furat Petroleum Company (AFPC), which was a joint venture between the SPC, Royal Dutch Shell, the Chinese National Petroleum Company (CNPC), and India's Oil and Natural Gas Corporation (ONGC). 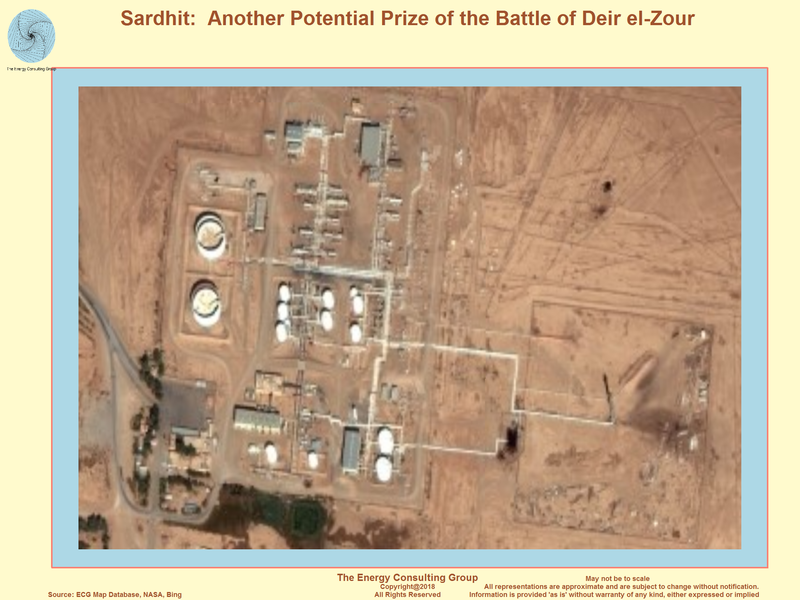 Other SPC subsidiaries included the Deir Ez-zor Petroleum Company, the Syria-Sino Alkawkab Oil Company, the Hayan Petroleum Company, the Oudeh Petroleum Company, and the Dijla Petroleum Company. International oil companies with interests in Syria prior to the conflict included Gulfsands, Sinopec, and Total, as well as several other smaller companies. By most accounts, nearly all of Syria's foreign partners have left the country. The General Organization for Refining and Distribution of Petroleum Products (GORDPP) managed the country's downstream portfolio for oil and natural gas. It also oversaw the operations of the Banias Refinery Company and the Homs Refinery Company, among other duties. Other important state entities overseen by the GORDPP included the Syrian Company for Oil Transport (SCOT, which operated the country's pipelines), Mahrukat (which dealt with refined products), and Sytrol (the state marketer of petroleum products). 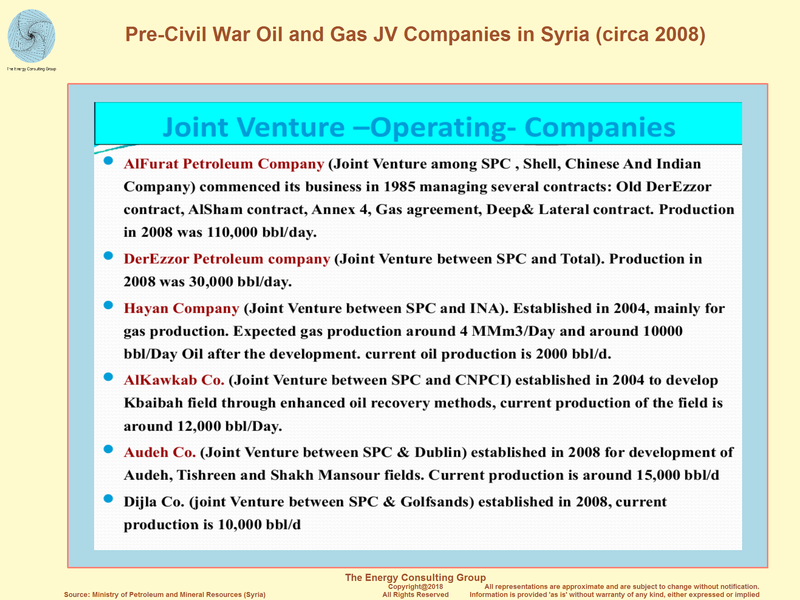 The Syrian Gas Company (SGC)—which fell under the GPC—was the key entity in Syria's upstream natural gas operations, a position it inherited after being split off from the SPC in 2003. Syria's natural gas distribution network was managed by the SCOT. The majority of Syria's gas-processing plants were operated by state-owned firms—led by the SPC—but there were a handful that were operated by international companies. The Ministry of Electricity oversaw the electricity sector in Syria, while the General Establishment for Electricity Transmission operated the country's transmission system. 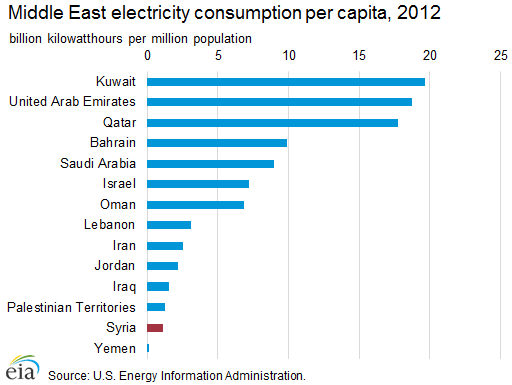 Syria also had separate entities for the generation and distribution of electricity. Syria's oil sector has been in a state of disarray since 2011. Production and exports of crude oil have fallen to nearly zero, and the country is facing supply shortages of refined products. The Oil & Gas Journal estimated Syria's proved reserves of oil at 2.5 billion barrels as of January 1, 2015, a total larger than each of Syria's neighbors except for Iraq.1 Most of Syria's crude oil is heavy (low gravity) and sour (high sulfur content), which requires a specific configuration of refineries to process. Sanctions placed on Syria by the European Union in particular—whose countries accounted for the majority of Syrian oil exports previously—limited the number of markets available to import and process the heavier Syrian crudes. The loss of oil export capabilities severely limited Syrian government revenues, particularly the lost access to European markets, which in 2011 imported over $3 billion worth of oil from Syria, according to the European Commission.2 Prior to sanctions, European refineries were the target market for Syrian oil because they were configured to process heavy, sour oil. 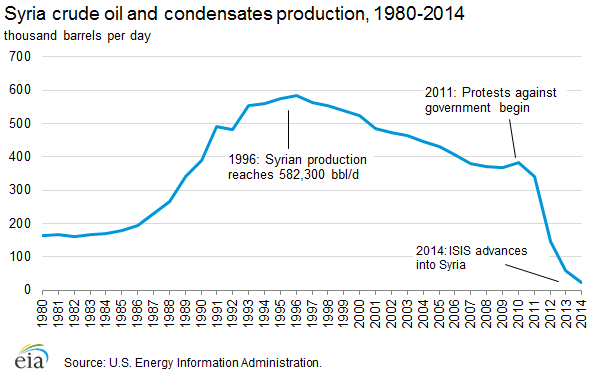 Since the swift advance of ISIS in 2014, Syrian oil production has essentially ceased. The lack of domestic crude oil production has caused the country's two main refineries to operate at less than half of normal capacity, resulting in supply shortages for refined petroleum products. Further, sanctions—and the resulting loss of oil export revenues—make importing petroleum products difficult. It is likely that Iran continues to supply Syria with crude oil and refined products.3 Oil theft is also a problem, with Syrian officials claiming that hundreds of barrels of crude oil are being stolen and shipped to neighboring countries each day. Syria's oil production, which averaged over 400,000 b/d between 2008 and 2010, was less than 25,000 b/d in May 2015. With the onset of sanctions by the United States, the European Union, and other countries, almost all of the international oil companies (IOCs) and national oil companies (NOCs) ceased operations in Syria, significantly limiting Syria's exploration and production capabilities. Most of Syria's existing oil fields are located in the east near the border with Iraq or in the center of the country, east of the city of Homs. 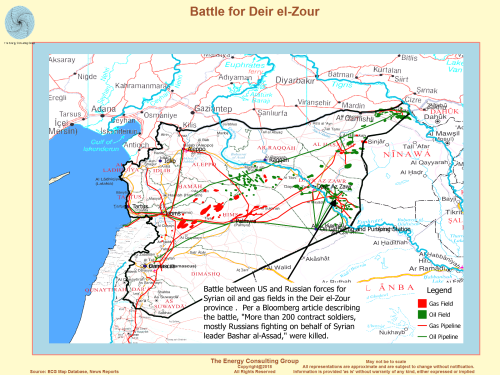 Possession of Syria's largest producing fields including the Deir-ez-Zour region—which includes Syria's largest field, Omar—has fallen to ISIS.4 The exact level of current production from these fields is unknown, but U.S.-led airstrikes have certainly caused structural damage in the region and have limited its output. 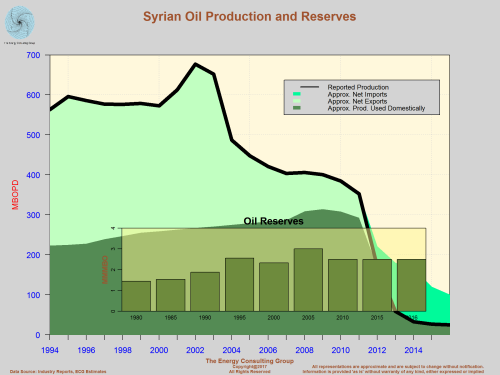 Syria's average oil production from 2008—10 was stable at approximately 400,000 b/d, but since the combined disruptions of military conflict and economic sanctions began, the country's production dropped dramatically. The latest U.S. Energy Information Administration (EIA) estimates indicate that Syrian crude oil and condensates production has fallen to barely 25,000 b/d—including production outside the control of the Syrian government. This level is a drop of roughly 90% since the conflict began in March 2011. The years prior to the onset of hostilities saw an increased emphasis on the use of enhanced oil recovery (EOR) techniques in Syria, with several companies promising increased investment in the country's mature oil fields. The AFPC utilized water- and gas-injection systems to aid recovery in many of its fields, and—with little in the way of new discoveries expected—EOR techniques are likely to become increasingly important for ensuring stable output should production resume. 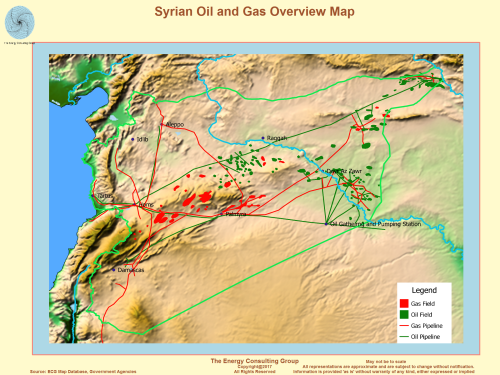 Syria also has shale oil resources, with estimates of reserves in 2010 ranging as high as 50 billion tons according to Syrian government sources.5 The Syrian government delayed a bidding round for the country's shale resources—scheduled for November 2011—because of the political situation in the country. Syria's crude oil exports are assumed to have ceased, and the country is having difficulties importing refined petroleum products. Syria has three export terminals on the Mediterranean Sea, all operated by the Syrian Company for Oil Transport (SCOT) under the GORDPP. 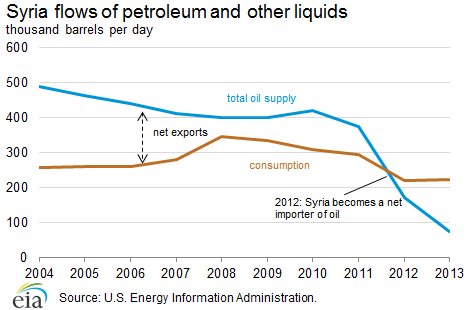 Syria has two crude oil export blends, Syrian Light and Syrian Heavy (also known as Souedieh). The combined capacity of Syria's two refineries has fallen to roughly half its pre-conflict output. Syria has two state-owned refineries, one in Homs and the other in Banias. The combined nameplate capacity of the two refineries at the beginning of 2015 was slightly less than 240,000 b/d according to the Oil & Gas Journal;7 a total capacity that met only three-fourths of Syria's pre-conflict demand for refined products. With damage to pipelines and other infrastructure around the refinery at Homs in particular, Syrian officials claim that the country's actual refining capacity now is closer to 50% of its pre-war nameplate capacity.8 Several proposed refineries are now on hold or canceled altogether, such as the proposed 100,000 bbl/d facility at Abu Khashab backed by the CNPC, which was canceled because of the security situation in the country. Syria's natural gas sector has not been affected quite as severely by the ongoing conflict as its oil sector, although dry natural gas production is down by at least 40% compared with pre—conflict totals. The Oil & Gas Journal reported that Syria held proved reserves of 8.5 trillion cubic feet (Tcf) of natural gas as of January 2015. Like the country's oil fields, the majority of Syria's natural gas fields are in the central and eastern parts of the country. Most of Syria's natural gas is used by commercial and residential customers and in power generation. Syria also uses its natural gas in oil—recovery efforts, with approximately 20% of daily gross production reinjected into the country's oil fields between 2004 and 2013. In 2008, Syria became a net importer of natural gas, but the country's current state of conflict—and sanctions—have affected the ability of Syria to receive natural gas. 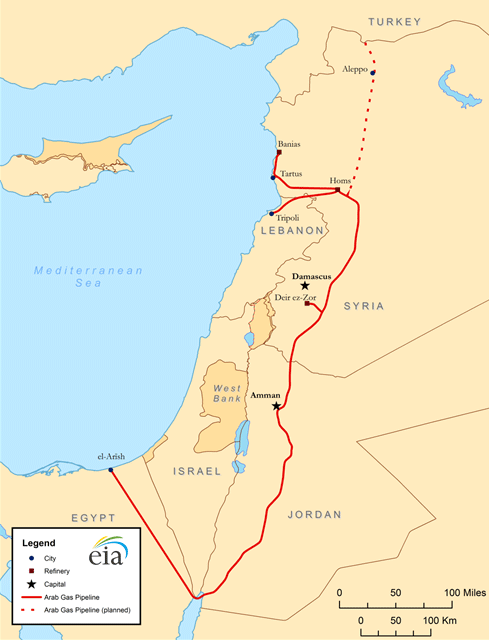 The only source of natural gas imports, the Arab Gas Pipeline, became the target of attacks as the conflict intensified, forcing the pipeline to shut down. Syria's plans to convert all existing thermal power generation facilities to natural gas—fired plants (many are currently using refined petroleum products) hinge on these import volumes being available, but this goal seems out of reach. 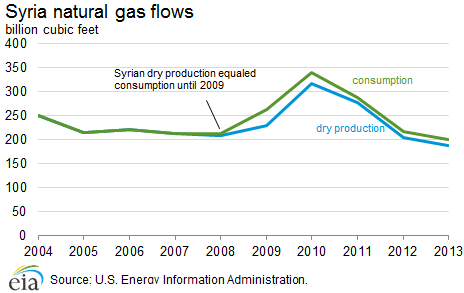 Syria's dry natural gas production fell to less than 200 billion cubic feet (Bcf) in 2013 according to estimates from EIA. In 2010, the last year under normal operating conditions, Syria produced 316 billion cubic feet (Bcf) of dry natural gas. By 2012, that figure dropped by 28% to about 227 Bcf, and EIA estimates that production was 187 Bcf in 2013. Prior to the current conflict, more than half of Syria's natural gas production came from nonassociated fields, with those volumes being redirected to oil fields and domestic demand centers through the country's domestic pipeline network. In 2012, 25% of Syrian natural gas production was reinjected into the country's oil fields to aid in oil recovery, a slight increase from the 2002—11 average of nearly 19%. According to Syrian government officials, in 2013 more than 90% of the country's natural gas production was used by the country's power sector. According to press reports, Syria is not currently importing natural gas from Egypt via the Arab Gas Pipeline. 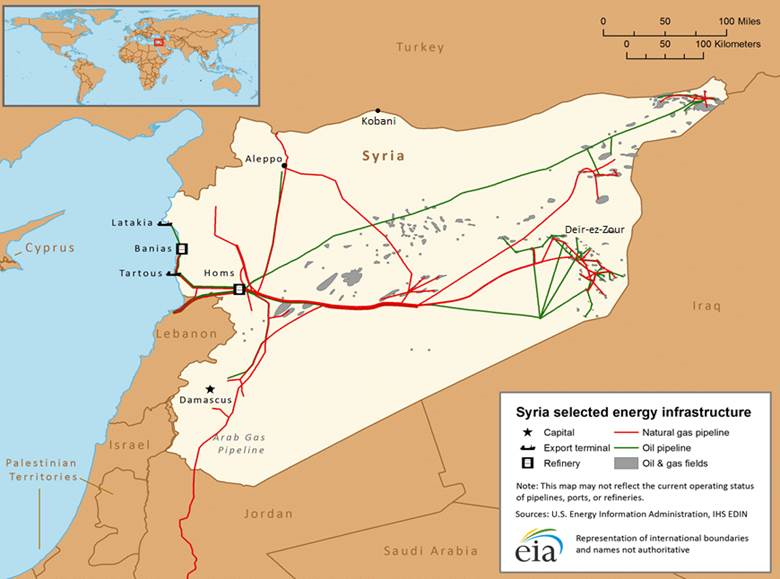 Syria has never produced sufficient volumes of natural gas to export. Prior to the recent conflict, Syria imported a small amount of natural gas from Egypt to supplement its own domestic production, but production volumes dropped by more than 60% between 2010 and 2011 (from 24.4 Bcf to 8.8 Bcf, according to Cedigaz data) and stopped in 2012. Those imports came via the Arab Gas Pipeline, which started operating in 2008 and sends Egyptian gas into Syria (near Homs) via Jordan. There were plans to expand the pipeline into Turkey, Lebanon, and eventually to Europe, but developments are now unlikely. 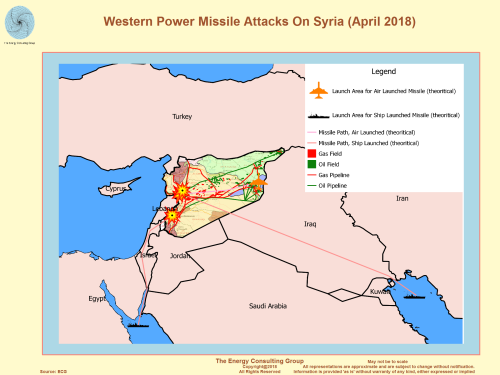 Syria's electricity infrastructure, including power plants, substations, and transmission lines, has been a frequent target of sabotage. In 2010, Syria generated almost 44 billion kilowatthours of electricity, 94% of which came from conventional thermal power plants. The remaining 6% came from hydroelectric power plants. Refined petroleum products and natural gas fuel Syria's thermal generating facilities. Syria plans to convert all of its thermal generation facilities to run on natural gas as soon as possible, although this is unlikely until hostilities end. Syria's lack of domestic refining capacity, the ongoing sanctions on the country's energy sector, and declining natural gas production combine to limit the availability of the necessary fuel for Syria's electric plants and have contributed to blackouts in many parts of the country. By early 2013, more than 30 of Syria's power stations were inactive, and at least 40% of the country's high voltage lines had been attacked, according to Syria's Minister of Electricity. Syria's electricity generating capacity was 8.9 gigawatts in 2012, although damage to electricity generating facilities, high voltage power lines, and other infrastructure has likely reduced the country's effective capacity. Electricity distribution losses, already 17% of total generation in 2012, have likely climbed even further. Prior to the current conflict, the Syrian government hoped to emphasize the importance of renewable energy and laid out plans to develop renewable energy sources in the country. The 11th Five-Year Plan for 2011—2015 made that goal clear; however, there will be no progress in the near term. In September 2012, Syria's Minister of Electricity announced plans to boost generating capacity by an additional 1.5 gigawatts over the next several years. However, as with most projects in the country, current conflict and lack of access to international capital makes such an undertaking impossible. Data presented in the text are the most recent available as of June 24, 2015. 1Oil & Gas Journal, Worldwide Look at Reserves and Production, January 1, 2015. 2European Commission, Trade in goods with Syria, April 2015, page 5. 3Middle East Economic Survey, “Damascus Cash Crunch as Crude Below 10,000 b/d”, volume 58, issue 18 (May 1, 2015). 4Middle East Economic Survey, “Syria's Economic Woes Only Set to Intensify”, volume 58, issue 5 (January 30, 2015). 5International Business Times, “Syrian Oil and Gas: Little-known Facts on Syria's Energy Resources and Russia's Help”, September 4, 2013. 6Middle East Economic Survey, “Syria's Economic Hardships Intensify with Fuel Shortage”, volume 58, issue 9 (February 27, 2015). 7Oil & Gas Journal, Worldwide Refining Survey, January 1, 2015. 8Middle East Economic Survey, “Damascus Cash Crunch as Crude Below 10,000 b/d”, volume 58, issue 18 (May 1, 2015). 9Reuters, “Iran grants Syria $3.6 billion credit facility to buy oil products”, July 31, 2013.